1. Combine Ranch Dips Mix, yogurt, sour cream, spinach, and walnuts. 2. Chill 30 minutes or until just before serving. 3. Serve with whole wheat crackers and raw vegetables. 1. 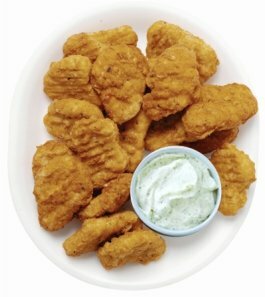 Combine 1/2 packet Ranch Dressing and Seasoning Mix with yogurt; refrigerate. 2. Combine remaining Ranch Dressing and Seasoning Mix with buttermilk; refrigerate. 3. Rinse chicken and thoroughly pat dry on paper towels. 4. Combine chicken and buttermilk mixture together in a food storage zipper bag. 5. Refrigerate 6 to 24 hours. 6. Heat oven to 425°F. 7. In a food processor, combine breadcrumbs, almonds, garlic powder and pepper. 8. Coat chicken in breadcrumb mixture. 9. Set a wire rack on baking sheet and coat with cooking spray. 10. Lay chicken pieces on wire rack and spray with more cooking spray. 11. Bake 16 to 18 minutes until no longer pink (internal temp at least 170°F). 12. Use yogurt mixture as a dipping sauce. Suggested by Stefan F. Gitschner. 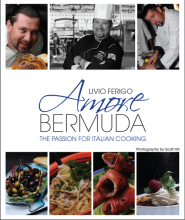 NTER TO WIN Chef Livio Ferigo’s Amore Bermuda cookbook!! Simply try out the recipes provided here from Hidden Valley Ranch OR submit your own favorite snack recipe, and comment/email mb.bi1552964921wt@st1552964921setno1552964921c1552964921 to tell us about it. We will choose from the comments who wins!